Back in the 1970s and 80s, these were always my go-to developers for 35mm film. I acquired these two packs many years ago in a job lot of darkroom chemicals being disposed of by someone giving up the dark arts. There were five full vials of both the Red and Blue, still looking as clear and unsullied as the day they were sealed. 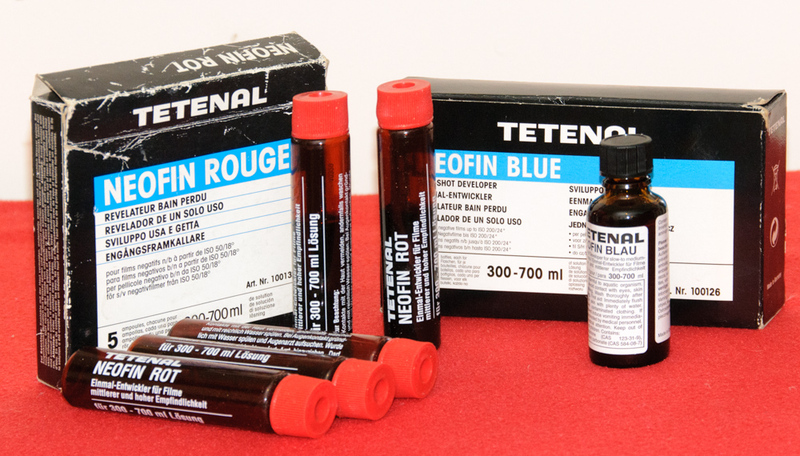 The long-ago discontinued Neofin Red must now be at least 20 years old; the Neofin Blue is more recent and is still available in the same packaging. Both are often described as ‘Beutler type’ developers and although I believe the original formulations were closely akin to Willi Beutler’s formula (he produced it for Tetenal), the later incarnations were different. 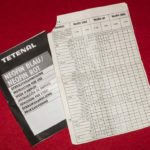 You can still mix your own Beutler developer, it’s incredibly simple and will give results similar to those you get with the Neofins, which are: high acutance, sharply defined granularity, no loss of film speed, good tolerance of a wide tonal range and what can only be described as ‘punch’. Beutler also uses just metol, sulfite and carbonate, dead simple. The Neofins evolved to include hydroquinone and possibly phenidone, so they really ceased to be real ‘Beutler’ developers. The effect you get from using either is very similar though. 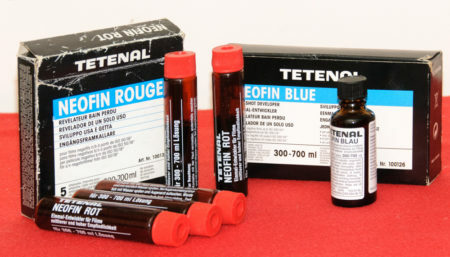 Neofin Blue is intended for slow to medium speed films, 25 – 160 ISO; Neofin Red was formulated for medium to faster films, 200 ISO or more, but I always believed it to be just a different concentration of the same basic ingredients as the Blue, just made more concentrated to keep development times down. You can develop faster films in Blue, but development time is a lot longer (Tri-X 120: 11 minutes in Red; 20 minutes in Blue). You will get grain, but it’s a good kind of grain. These are not fine grain developers. So, why am I writing this about a developer that you can no longer buy? Well, you can still buy the Blue and it’s well worth a try if you are unfamiliar with this breed of developers. The instruction manual and times for the Neofin developers. Did I mention Neofin Doku? – I also have some of that. It was formulated for that other long-lost film, Kodak Technical Pan. More on that another time. The Red that I acquired I’ve been using recently to process some Tri-X 120 from the Ensign camera, as well as from my Ensign Autorange 820. Despite its age, it performed exactly as it should, no deterioration whatsoever. Thing is, every vial I open is like using up one of the five wishes bestowed upon me by some benevolent genie – okay, that’s a bit much, but when it’s gone, it’s gone, never to be replaced. 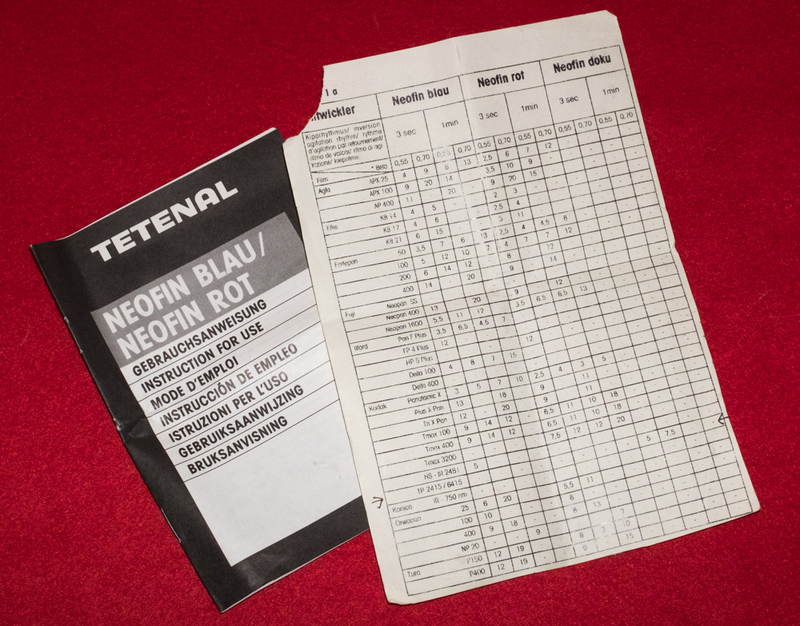 Some examples of film processed in Neofin Red follow in my next post. This entry was posted in Film negative. Bookmark the permalink.